SUNDAY 21ST APRIL 2019 | The Watercourt | Noon – 3.30 pm. 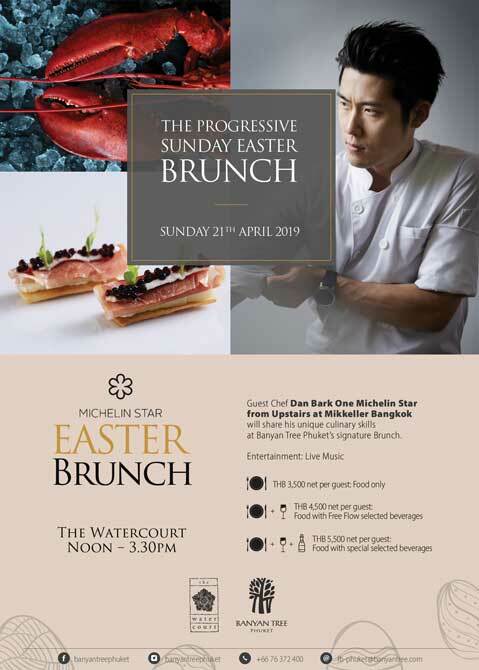 “Michelin-Star Easter Brunch” Chef Dan Bark from “Upstairs” Bangkok will share his unique intriguing culinary skills in our Banyan Tree Phuket’s signature and famous Brunch Chef Dan Bark, formerly Sous Chef of the Three Star-Michelin restaurant Grace in Chicago. Food only | THB 3,500 net per guest. Food with Free Flow beverages THB 4,500 net per guest. Food with ½ bottle of beverage THB 5,500 net per person.